The first image from Walter Hill‘s action film Bullet to the Head has gone online. Sylvester Stallone plays a New Orleans hitman who teams up with a cop to take down the man who killed the cop’s partner. How does one accomplish this? 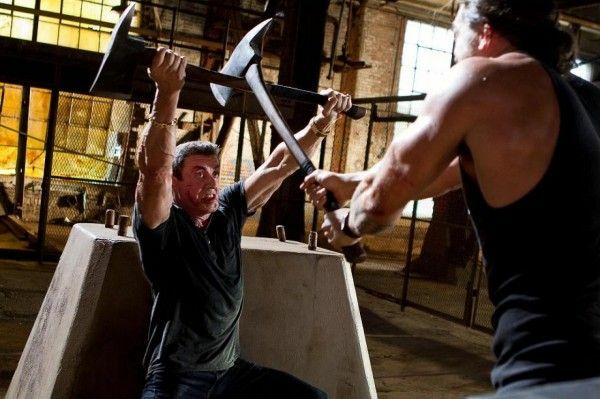 Judging by the new image, the answer is axe-fighting. Keep your guns and your swords and your fists. Axe-fighting is where it’s at. But the real threat to Stallone isn’t the axe coming at his head. It’s that his forearm is about to burst like a watermelon in a vice. Hit the jump to check out the image. The film also stars Sarah Shahi, Jason Momoa, and Adewale Akinnuoye-Agbaje. Bullet to the Head opens on April 13, 2012.